There are probably few franchises in recent memory as emotionally debated as Peter Jackson’s three-part adaptation of ‘The Hobbit’. Taking J.R.R. Tolkien’s children's classic and stretching it into over eight hours of cinema, the series has been equal parts praised and criticised, as an adaptation, as an experience in itself and as a companion to Jackson’s Oscar-winning masterpiece ‘The Lord of the Rings’. In many ways, the guiding principles which make the successful moments of ‘The Hobbit’ so sublime also make the less-successful moments such a disappointment – Jackson’s daring and unbridled excess. Over the past four years, I’ve covered The Hobbit Trilogy here at SWITCH, reviewing the theatrical releases of all three films, so it seems fitting that I should round it off by looking at the other version of Jackson’s trilogy – the extended editions. It was a concept he started with ‘Rings’ at the height of DVD, a home video version of the films that allowed him to include extra footage to the already lengthy running times. They were never intended to replace his theatrical cuts (though many consider them superior) but rather to offer audiences further detail into Tolkien’s epic. Keeping with tradition, Jackson did the same with ‘The Hobbit’. The idea of making them longer probably sounds unnecessary at first, the slight narrative of Tolkien’s book already stretched to its limit. However, while the extended editions of the films aren’t as significant as those of ‘Rings’, there’s some interesting material worth checking out. For the most part, the additions include extra character moments rather than extended sequences. Very little from Tolkien’s book didn’t make it to the screen, and Jackson and his screenwriting team drew on Tolkien’s other Middle Earth writings to expand the narrative. Because of this, the extra material ends up only being around 20 minutes per film (as opposed to the often 45 minutes added to each ‘Rings’ film). As with the previous trilogy, the effect of this extra material works on a film-by-film basis, in some cases improving what’s there and in others adding unnecessary baggage. For ‘An Unexpected Journey’, most of the material centres around Bilbo (Martin Freeman) and expanding the backstory around the dwarves. We see Bilbo as a child, spend more time in Rivendell, get a few extra musical moments (including reinstating the Goblin Song from the novel) and are offered more insight into the White Council and Radagast’s warnings about the Necromancer. The theatrical cut of ‘An Unexpected Journey’ is easily the strongest of the three films, most assured in its energy, tone and rhythm. Because of this, the new material feels less like a drastic new version and more of a curiosity – most of it is interesting but very little of it is vital. It certainly doesn’t take the place of the original cut. The additions to ‘The Desolation of Smaug’ however make a surprising difference to the problematic second film. ‘Smaug’ was the first sign the series was about to jump off the rails – it offered a stunning opening and closing act, but suffered immensely from a dull and bloated second act centred around Lake Town. While the extended version doesn’t remove any of the Lake Town sequence, it does balance the film out by adding more material to the first act and making the middle section less distracting. The most exciting additions include an expansion of the Beorn and Mirkwood sequences – even though they’re major highlights in the book, they were sorely underrepresented in the theatrical cut, and their inclusion here is probably the best in any of these extended editions. The sequence with Gandalf (Ian McKellen) at Dol Guldur is reshaped to include Thrain (Anthony Sher), Thorin’s father. This is one of the few moments where Jackson offers an alternative to his theatrical version. Of the three extended editions, ‘The Desolation of Smaug’ is the strongest. In much the same way that the extension of ‘The Two Towers’ was superior, this version fixes some of the tonal imbalances inherent in the theatrical cut, and even though it doesn’t repair the gaping flaws, it offers enough really good new material to make up for them a bit. Taking J.R.R. Tolkien’s children's classic and stretching it into over eight hours of cinema, the series has been equal parts praised and criticised. The film least affected by its added material is ‘The Battle of the Five Armies’, most of the new footage bolstering what’s already there rather than adding whole new sequences. For the most part, what we get is more of the battle, and a bloodier battle at that. The extended cut alters the classification rating up to an MA 15+, the only film in the Middle Earth Saga to do so. The problem is, even with its short running time, ‘Armies’ feels like the most bloated film in the series already, and while the added energy of the new battle material makes it move with a bit more lively, it still feels (to paraphrase Tolkien) like butter scraped over too much bread. That said, the rest of Thorin’s party get more screen time, and Thorin’s funeral at the end helps land the strange melancholy that ends the trilogy a bit better. For fans of the series though, the biggest thing the extended editions offer are not the films themselves, but the special features they come with. Jackson set an enormously high bar with the over 18 hours of behind-the-scenes material offered on the extended sets for ‘Rings’, which are probably still the finest home video releases of all time. While these corresponding editions for the Hobbit films may lack the multiple commentaries and thousands of production images, the documentaries clock in at over 27 hours, all of it fascinating and intriguing and beautifully made. I have to admit, my excitement at the release of each set had less to do with the films and more to do with the special features. For any film buff, these sets are worth the price for the documentaries alone. On top of that, all three films look and sound spectacular, with 1080p 2.40:1 transfers and DTS-HD MA 7.1 tracks. All three extended editions are also available in 3D, and this week (with the release of ‘The Battle of the Five Armies’) come together in a beautiful box set that matches the design of the ‘Rings’ extended Blu-ray set. So I guess the real question is: are they worth it? Well, that entirely depends on how you felt about 'The Hobbit' Trilogy in the first place. If you found Peter Jackson’s additions, subtractions and lengthening of Tolkien’s masterpiece aggravating, these longer versions don’t offer much to fix that. If you found them bloated, rambling and unfocused, that isn’t fixed either. If you were hoping they would suddenly fashion the series to meet the standard of ‘The Lord of the Rings’... well, that was never going to happen. However, if you were like me and found much to love about this adaptation, enough to overlook its flaws and be entertained and enthralled by them, you’ll probably find yourself just as entertained and enthralled by the extended editions. They don’t improve greatly on the theatrical cuts (and I never prescribed to the idea that they did the same for ‘Rings’ either), but they do offer interesting new material and world-class special features that literally take days to get through. If you find yourself going there and back again to the theatrical cuts, then these longer versions may tickle your fancy as well. The 'The Hobbit Trilogy Extended Edition' competition has now closed. Winners will be announced shortly. Competition opens at 8pm AEDT on Sunday 15th November 2015 and closes at 11:59pm AEDT on Sunday 22nd November 2015. Five winners will be chosen at random on Monday 23rd November 2015. To successfully win, entrants must fulfil the above entry conditions before the time the competition closes. Current members/followers are eligible to enter the competition. Only one entry per person. Only one winner per household. To be a valid winner, the entrant must not have won a prize from SWITCH within the last 28 days. 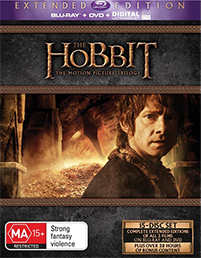 Each winner will receive one Ultraviolet Blu-ray copy of 'The Hobbit Trilogy Extended Edition'. By entering, you agree to receive occasional emails from SWITCH in the future. If you decide to unsubscribe from these updates, any further entries will not be applicable. Only Australian residents are eligible to enter. 'The Hobbit Trilogy Extended Edition' is available on Digital HD, Ultraviolet Blu-ray, Ultraviolet Blu-ray 3D and Ultraviolet DVD on Wednesday the 18th November 2015 from Roadshow.